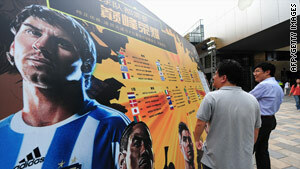 Pedestrians at a mall in Beijing, China, stop to look over a poster featuring World Cup groupings. (CNN) -- Police in China said they broke an illegal soccer gambling ring ahead of the World Cup in South Africa, the state-run Xinhua news agency reported on Tuesday. The bust was made in Shenyang, the capital of the northeastern province of Liaoning. Forty-eight people were taken into custody, the report said, citing police. Police told Xinhua on Tuesday they investigated what they called a major web soccer gambling case and made the bust after a two-month probe. Police seized over 420,000 yuan, or more than $61,000 U.S., in cash and froze around 1.03 million yuan, or more than $150,000, in bank accounts belonging to the gang members. Fifty computers were seized. Police said the operation got going in November and was broken in early March amid a government-wide crackdown on online gambling launched in February. Police say they've solved 740 online gambling cases and arrested more than 3,600 suspects. They say they've frozen 700 million yuan, or around $102 million, in funds since the crackdown began.